AT&T may be able to claim the fastest LTE network across the U.S., but Verizon certainly has the most expansive. Today, Verizon announced that it has lit up its LTE network in its 500th market, which completes the initial buildout of the network, and means that Verizon's LTE network covers almost the same area as its CDMA network. 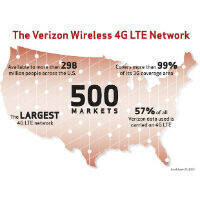 Verizon began building its LTE network back in 2010, and now it covers 99% of its CDMA footprint. Parkersburg, West Virginia gets the honor as the 500th market to get Verizon's LTE network, which now covers 298 million people, and that's an impressive figure considering there are only about 330 million in the country, and a fair portion of that number are children who probably don't need LTE service just yet. Verizon has completed the buildout, but hasn't yet turned on LTE service in Alaska. That is expected to happen as soon as next month, and will mark Verizon being in all 50 states for the first time, because Alaska did not have Verizon coverage before. Of course, completing the buildout is only one step of the process, because Verizon still needs to work on increasing network capacity in more densely populated areas like NYC. Verizon has confirmed that it is already working on those issues, and cites its newly acquired AWS spectrum as part of the solution there. The new mobile view for PA is actually not that bad. Good job guys. OT: Verizon has the best coverage, yes, but the prices of their plans are expensive. You get what you pay for and as of now, you're paying for LTE coverage all over the country. It's worth it IMO. I wouldn't leave Verizon, even if AT&T is faster and has better devices. I respect Verizon for going straight to LTE, building the network as quickly as they did, and focusing on covering as wide an area as possible. I don't love the company, but I have to respect them. According to there coverage maps, I should be covered in LTE. Yet the LTE network here is spotty and unreliable. It states that it covers "almost" the same area as 3G. Remember, as long as you get at least one bar of LTE, you're technically covered. When Verizon refarms its 3G to LTE, you should get greater service from it because every cell tower will transmit a LTE signal. I HATE it, switched to Desktop View. Don't get me wrong, it's probably great for those who have super slow phones or flashless watered-down web iBrowsers. Wow, 500!!!!!! !, and that's just the "initial roll-out"!! Well, damn, that's why my Verizon SuperSmartphone blazes all over the web. Verizon = Tramping on the rest!!! yeah, same here in Spring Hill, TN but just the west side. thats great but i wish they improved there lte signal over here in los angeles i stilll have my work phone with them and lte signal in most buildings is pretty weak phone drops down to 3G and i get full bars of 3G i also have my personal phone from att and from what i noticed att maintains lte deep in buiildings. Now that they have LTE done. They have to start all over again and do LTE Advanced. I would expect the transition from LTE to LTE-Advanced to be much, much easier with the infrastructure currently in place. I don't know enough about the tech, but would it be more of a software update? Nope. LTE advanced has a different architecture to delivering the signal to devices than normal LTE. For example, if a LTE network gets congested, normally you'd just have to deal with it. With LTE advanced it decides if a network tower is already congested and switches you to a tower with less people. It also has far better speeds (100mps compared to the 15mps currently offered by their network). They have to update their towers, phones, and the phones need to support the network (snapdragon 800 chips come with LTE advanced support built in). That 'children' comment is pointless, Verizon is including children in their 298 Million number. You should remove it. Remove children and they would have to say they cover about 215 million people. More/Less Verizon is claiming that where 90% of the people live, they have LTE. But they are not claiming anything about where people travel. Right now in the west, people drive in and out of LTE covered areas daily. Their LTE coverage in the west is about half their CDMA coverage. Going by your math then from your own statement, Verizon's CDMA coverage is about 430 million people?! Damn when did we get this many people in the US. If I do recall there CDMA coverage in the west was spotty to begin with, but that being said it doesn't explain the lack of LTE in the west.